It’s been a very strange year of many ups and downs and I apologise to everyone who follows me, likes my blog and enjoys reading my posts. I promise to make 2019 the year when I pen my poetry and get painting again. After one of our beloved Border collies died suddenly last year, the arrival of our Slate merle pup in early spring and Skye, our surviving blue merle having a Stroke, I wondered whether life would ever become calm again. However, Storm is a year old now, pictured above, and has a lovely nature; she gets on really well with Skye and has helped Skye get over her Stroke by assisting with her physio! We’ve had lovely holidays in North Norfolk walking along the Coastal path, across the salt marshes and on Holkham beach and I have enjoyed a few hours here and there to paint. I hope you like my photos and my watercolour painting of the cheeky robin who visits my bird table every morning. I have designed a Christmas card, so he can be enjoyed by friends and family. I wish you all a warm, peaceful and jolly Christmas and the best of luck for 2019! 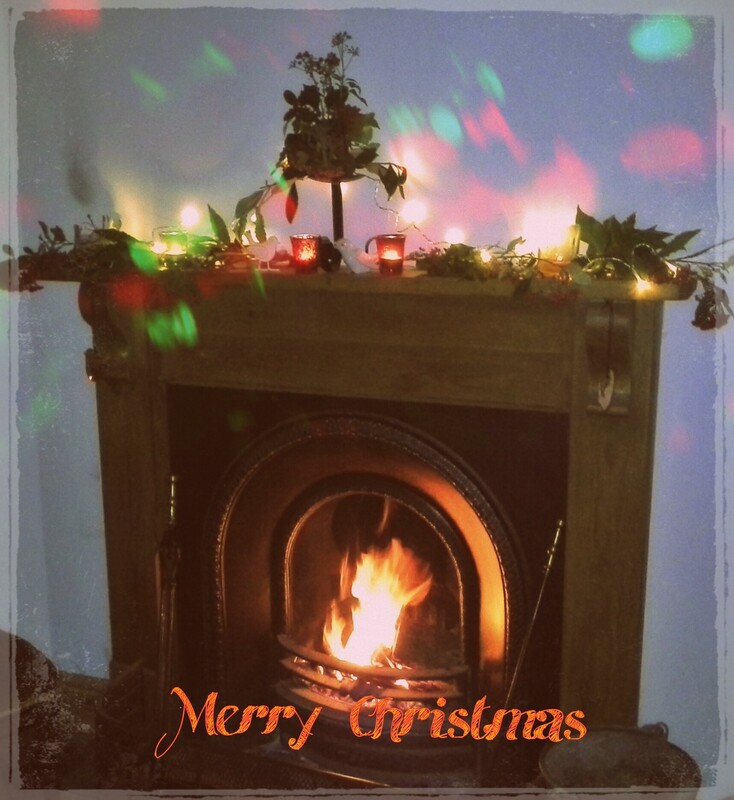 Merry Christmas and a Happy New Year to all my blogging friends. Thankyou for visiting and commenting on my blog over the year it is wonderful to have so many online wordpress friends.The last month has been challenging for me because I have injured my spine and cannot sit or stand for very long! Everyday gets better though, but festivities will be quiet for us this year. Hubby has also had a nasty chest infection, there are so many bugs about at this time of the year. Walking is a great way of helping my back pain but the dogs are having to put up with walks around the village for a while until I get stronger and then I’m sure I’ll feel inspired again to write more poetry. However, I will be keeping warm by my fire, having lots of lovely nibbles and warm drinks. 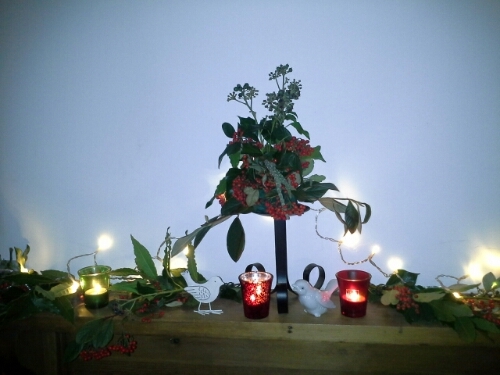 The mantel decorations are all from our lovely cottage garden. I hope you like them.